Going bleach blonde is definitely a fun way to change up your look, but it's also pretty high-maintenance. 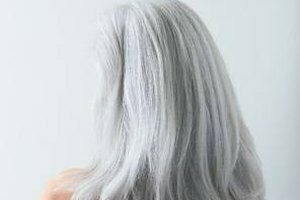 When roots start showing, continual touch-ups can get really old, and you might feel ready to go back to your natural color. You could either wait for the bleach blonde to grow out and then chop it off, or dye the bleached part gradually until it reaches a shade similar to the roots. Your best bet is to go to the salon and have a pro hairstylist handle this; but you can also try to do it on the cheap at home. 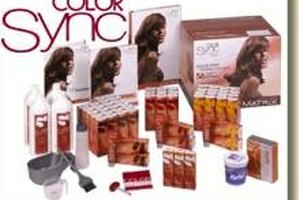 Keep in mind that the process of restoring hair color to its natural state is a gradual one. According to L'Oreal hair-color specialist Christophe Robin, it isn't wise to go more than one or two shades darker than your current shade per dying session. Shampoo your hair. Do not use any conditioner, as this prevents the pigments in the dye from taking hold in the hair shaft. If you have sensitive skin or a sensitive scalp, wait approximately 12 to 24 hours after shampooing to continue. This lets your body's natural oils build up and protect your scalp. Change into old clothing that you wouldn't mind being ruined with hair dye, and drape an old towel over your shoulders. Put on a pair of disposable plastic or rubber gloves to prevent dye from staining your hands, fingernails and skin. Take a one-inch piece of hair and apply the dye starting at the top of the bleached part and working your way down to the ends. Repeat until you cover all of your hair. Let the dye to soak in for the time recommended on the box instructions. Rinse your hair under cool water. Cool water closes the hair cuticles, allowing more pigment to stay within the hair shaft. Rinse until the water runs clear. Apply a moisturizing conditioner made for color-treated hair to repair some of the damage from the dying process. 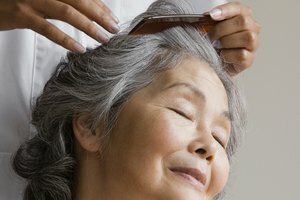 Rinse the conditioner; some color may come off, which is normal. Rinse until the water runs clear. Towel dry your hair and then let it air dry. 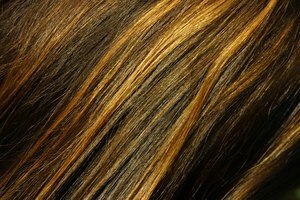 If your hair needs to be dyed again to return it to its natural shade, wait two to six weeks, then repeat the process. The darker your natural shade of hair, the longer it takes to dye back from bleach-blonde. Be patient. Different hair colors have different undertones. Ash colors are on the cooler side of the color spectrum, and golden colors have reddish undertones. Neutral colors fall somewhere in between. Take this into account when choosing your hair dye.